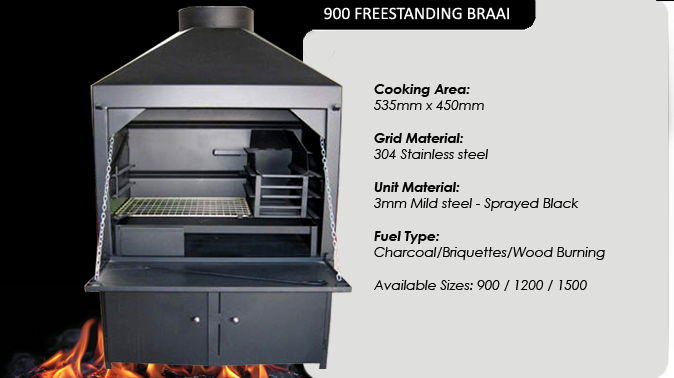 The Deluxe freestanding braais clean lines and brawny frame is designed to fit right in to any home. Constructed from quality 3mm steel, this durable unit eliminates the hassle of building and the time associated with such a project! All of our Freestanding Braais welding on the outer box structure is done neatly out of sight so that we do not have to grind the welding thus weakening it. As a added feature, all of our Deluxe Freestanding Braais has a reinforced ember maker, ensuring that it stays straight while you build a fire to your hearts content, all the while protecting your braai! Our Freestanding Braais also includes a fitted light fitting enabling evening entertainment. Installable in under four hours, this braai enables you to literally light your first fire with in twenty four hours of installation! 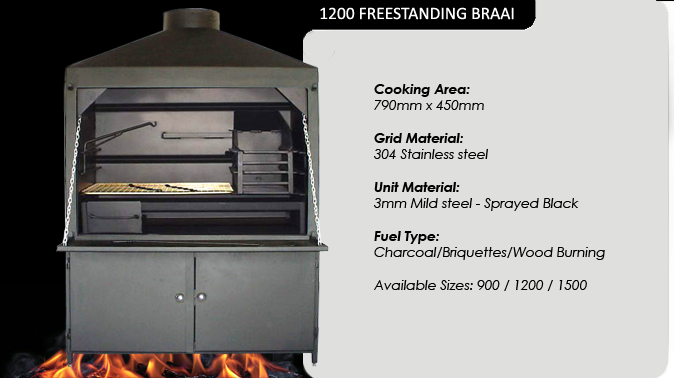 Our freestanding braais truly reflects the essence of South African braai culture. Whether entertaining fiends & family or just relaxing in front of the fire, this unit is sure to lend value to any occasion! The Deluxe freestanding braai’s clean lines and brawny frame is designed to fit right in to any home. this braai enables you to literally light your first fire with in twenty four hours of installation! Our freestanding braais truly reflects the essence of SA culture. this unit is sure to lend value to any occasion! and the time associated with such a project! spit cabinet, Heavy-duty spit motor & spit arm.